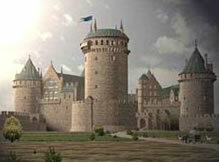 Medieval castles were dominant from the early 10th century right through to the mid 17th century. During this time they changed dramatically from the early motte and bailey castles through to concentric castles with thick stone walls. Many lessons were learnt and it is fascinating to see new ideas take shape and spread across European castles. The medieval castle arguably reached its zenith in the late 13th century with Edward I building the great castles of North Wales. When William 1st (right) crossed to England in 1066 he enforced his power with a string of motte and bailey castles built across England. Essentially England was, for the first time, controlled by strategically sited castles. However as the Normans came to dominate the land they needed more than what was effectively a large fort. They needed a home, a court of justice, a storehouse, refuge and somewhere to meet and entertain their equals and of course their King. However it was the crusades, which helped to bring back fresh ideas, and pushed castle building to its apogee. Richard the Lionheart started what was for it’s time the most formidable castle in the whole of Europe, Chateau Gaillard. Unfortunately he died before its completion and it was left to his brother John to lose it in a long and bitter siege. Listen to a Medieval Rock Symphony CD on the life of King Arthur - a great gift idea!